CONSORTIUM FINANCE NETWORK: Market Volatility: Can You Stand It? Market Volatility: Can You Stand It? Summer, 2011, has marked a rambunctious time of swirls and volatility in equity markets. It feels like 2008 all over again. Can you stomach it? No, you can't stand it. Nor can you explain it, follow it, track it, quantify it or tolerate it. A day when equity markets slide 2, 3 or 4 percent is followed by days when they surge, soar or promise that a new bull market is around the corner. And then comes the nose-dive again, another day when selling begets more selling, which contributes to panic and wonder. It churns the inside. Can the old finance texts explain it? Can market watchers and pundits project it? Many think they do. Do hedge funds and high-frequency traders profit from it? Certainly they try. Are hedge funds and high-frequency traders responsible for it? They certainly contribute to it. Do technical trend-followers try to quantify it or forecast it? Yes, when they unveil graphs, present variance analyses, or analyze "VIX" (market-volatility) indices. Often over the past two months, it has felt like 2008-09, like 1999-2001 when technical stocks bounced around and then burst, like 1998 when the collapse off Long-Term Capital caused a month or two of panic, or even like the long-ago days after crash of 1987. 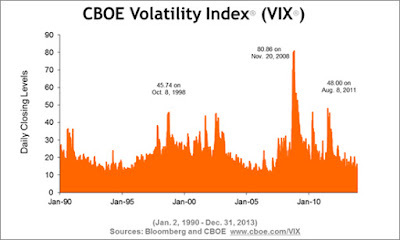 Everybody has a reason to explain volatility. Many say they can see it coming. Not many, however, agree on the specific causes. Others quietly try to make money from it. Others are squeamish, and yet others bolt. The suspected causes are as broad as the number of market participants. The most common blame is uncertainty. Markets are engulfed in too many unknowns about where the economy is heading and how companies will fare in uncertain conditions. Amid widespread uncertainty, market participants separately try to determine what economic trend is dominant. And the outcome might be violent swings in market values. Others blame high-frequency traders, the large segment of traders who buy and sell thousands (millions?) of shares electronically in time frames measured by seconds. They don't value companies, project cash flows, or analyze the long-term fortunes of companies. They use technology prowess to get in and get out, faster than all other participants--including mom and pop on Main Street. Among themselves, they race to see who can respond and act on market signals most quickly. They buy in certain markets and geographies and sell in others. They buy options in one market, sell equities in another. To them, a decline in profitability at a manufacturer because of an increase in costs of raw materials doesn't matter. They look for signals, trends, and momentum. And often they replicate the activity or trading patterns of their peers and competitors (a phenomenon now known as "crowded trades"). If one is selling, others do, too, and an equity market dives 2 percent without reason. Panic among retail investors contributes to volatility. They call their financial consultants to order them to sell because they can't bear the fluctuations. How often have we heard when seasoned investors give up on stock investing and send instructions in sell all equity holdings immediately, so they can sleep better at night? Why wouldn't a succession of hundred-point declines in markets cause even the most experienced investor to give up? Who wouldn't feel the urge to sell and reduce all risks when portfolios in 2008 plunged by 20-plus percent? One segment blames short-sellers. Short-sellers do exist. Not necessarily those who sell equities short as a hedge for a long-term portfolio of stocks, but those funds and traders whose primary purpose is to investigate and analyze the bad fortunes of companies and profit from a possible decline in their stock values. Some say short-sellers spur doomsday moods by broadcasting the vulnerabilities or downturns of companies, which lead to sell-offs. Meanwhile, they quietly profit from such declines after establishing short positions. The continual effort to guess at or measure what government entities or regulators are thinking or will say, do, enact, or support (or what they won't do) contributes to wild swings in markets. All the guessing leads to conflicting views about whether to buy or sell. In the past decade or so, leveraged hedge funds will swear they don't contribute to volatility. But whn they must sell assets to reduce borrowings, they often must sell the most liquid assets (Treasuries and exchange-traded equities) to raise cash. As a result, they contribute to sell-offs in markets. Traders, investment managers and economists now agree there exists something called world-wide contagion: What happens in Greece has impact on markets in Chicago and New York. What happens in Tokyo influences activity in the U.S.--for many reasons. Economies and markets are intertwined. Companies have global operations and sell in global markets. Investors and traders have diversified portfolios with exposures around the globe. When they buy or sell equities and sniff out opportunities or fear downturns, they have their eyeballs on emerging markets, as much as they watch trends in the U.S. and Europe. What is the long-term impact of all this market madness? How will we learn to handle market turbulence, occasional market panic, and unrelenting uncertainty? Business leaders and bankers fear volatility leads to lack of trust and confidence in capital markets. Investors shy away, preferring to invest in money-market funds or Treasuries, feeling disadvantaged or uncomfortable with equity portfolios. Others seek shelter in fixed-income investments and commodities (and, yes, even gold). Sophisticated investors look to "alternative assets": hedge funds and private equity. Others wait it out. They return when measured or observed volatility (from, say, "VIX" indices and the like) decline to tolerable, bearable levels. They jump back in when market swings can be rationalized, explained or when market indices follow a pattern. And often in the long term, memories tend to be short. When confidence and a degree of certainty are reintroduced, market participants (investors, traders, researchers and mom and pop) somehow tend to forget treacherous days and once again set off to chase opportunity and profits.